I bet you thought this was a “shatter the glass ceiling, woman power” Lean In-type career inspirational post, huh? It’s not. While I have all kinds of thoughts on the above topic, what I want to talk to you about today temporarily supersedes the importance of grabbing a seat at the table in the professional world. What I want to talk to you about today is the importance of grabbing a seat at the table in your medical world . Taking charge of your own cancer diagnosis/health and making sure you have all the information you need to heed proper advice and make informed decisions. Cancer is no joke. It’s scary, it’s crazy and shockingly, you find out that doctors and medical personnel are just people. They make mistakes ALL THE TIME. At the end of the day, most of them aren’t miracle workers or fortune tellers- they make the best educated guesses for your course of treatment based on the information available to them at the time. That’s why it’s important to do your research, listen to your body, and get second (or 3rd) opinions. The worst that can happen is that the same advice is given and you’ll feel that much more confident in moving forward. It’s funny because in my professional life, I’ve always been more of a “big picture” thinker. Selling the idea of a big picture, helping people focus on the big picture, etc. It’s not like I didn’t care for the details, I just preferred to focus more on the grander goal as a whole as I tackled through. With that said, I’ve somehow become the opposite in dealing with my own cancer diagnosis. Of course I have my eye on the prize (kill the cancer, hopefully forever) but I have also become obsessed with the data, the details and being in the weeds of all of that as I crawl through the land mines to beating cancer. Something in me changed the day I heard those 3 awful words, ” you have cancer.” And in turn, I learned the importance of grabbing a seat at the table in my medical world. Everyone’s approach and reaction to learning they have cancer is different. I totally get that some people don’t want to know anything and take the hands-off approach. I respect that. However, I do want to encourage those that are curious to take a moment, come out of shock of hearing your diagnosis, and grab a seat. Learn to take rein of your medical treatment(s). This lesson also applies to those pushing for a diagnosis. You are the only one who knows your body. And when something feels off, fight for it to be resolved. I can’t tell you how many times I’ve come across young women who were repeatedly denied mammograms, or brushed off by their doctor because they were too “young” to have cancer. Even my own primary doctor checked me in June for my annual, haphazardly checking my breasts and sending me for an endoscopy because she noticed chronic inflammation. It was during a routine self examination (four months later!) that I knocked into the (pretty massive) lump and pushed past her “it’s probably a cyst” commentary and got the ultrasound appointment. It was cancer. I was initially upset at my primary doctor but then I realized these kinds of things happen all the time. There are so many cases of young women having to repeatedly fight for their symptoms to be checked out and confirmed. Yes, we get it – we’re young, but that doesn’t mean we’re immune to cancer. It’s important to trust your body and fight for the best ways to protect it. As cliche as it sounds, knowledge is power when it comes to your health. I didn’t have the best first meeting with my NYC oncologist. I couldn’t get a word in, I was so overwhelmed by the speed of which she was hurtling information at me and I just plain felt uncomfortable. I wasn’t necessarily challenging her methods, I just wanted to know what else was out there. Luckily, she was very open to me splitting my treatment (doing chemo in D.C. to be closer to my family) and I ended up meeting with the medical team at Hopkins for a second opinion. The D.C. oncologist offered a slightly different chemo route but more or less same road and overall take on my diagnosis and treatment. Since it was different from my NYC oncologist’s opinion – I challenged her a TON. She gave me so many studies, stats, and data comparing the two different routes of chemo for my type of breast cancer and for the first time since my diagnosis, I felt comfortable moving forward. Same went for surgery. If you have the choice, breast cancer surgery is a very personal matter. There’s no right or wrong choice, you just have to make the best choice for you. And that took awhile for me to wrap my head around. Often times a woman’s femininity, identity and overall “womanhood” can be tied to her breasts. This was the hardest decision for me yet (hopefully of all in this cancer chapter). I went back and forth, I talked to a couple surgeons, doctors, and survivors. I talked to my family and closest friends, I researched, and I meditated on my own thoughts and feelings. I also learned that sometimes you may like one doctor’s personality more but prefer another’s approach and technique. In the end, I made the decision that is best for me given the facts surrounding my case. A big part of me gaining a seat at the (medical) table’s credit goes to my amazing oncologist at Johns Hopkins Sibley Memorial (more on her later). I loved her upon meeting but once we got to know each other, she really tolerated my curiosity and always loaded me with studies, findings, and reliable hard data. She helped me find a voice in dealing with other medical personnel. As I’m transitioning my treatment to NYC, I’m sure I will hit some bumps in the road as I meet new medical folks and adjust to different hospitals’ styles and opinions. However, I know so much more about my own disease now than I did 5 months ago and a lot of that came from asking questions and seeking answers. Sometimes, the answer may be “I don’t know, we don’t have studies on that yet” and while it’s frustrating – I find comfort in knowing I at least asked. I also know better when to listen and when to challenge. I can’t tell you how many women I have come in contact with since my diagnosis who have told me, “I wish I’d thought to get a second opinion, I just did what the doctor said.” I’m not saying they all regretted it or you should always challenge, I’m just saying – it’s important to know that no one knows your body as well as yourself so you owe it to be its biggest advocate. Take the time to know your disease, your options, and most importantly, trust your gut. A medical team can stress or strengthen you and in what’s probably the most intense time of your life, you owe it to yourself to find a team that lets you sit at the table. 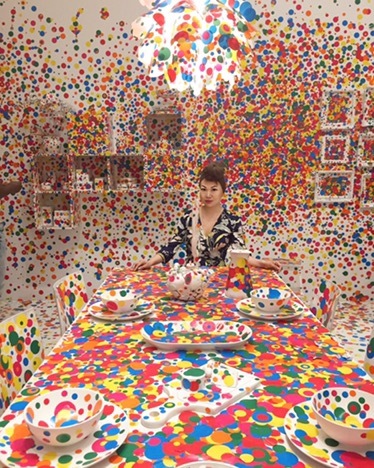 Here’s me “sitting at the table” in Yayoi Kusama’s “The Obliteration Room”, a once all-white space decorated with colored dot stickers from patrons. Having chemo in the winter ensures I don’t get much sunlight so ignore the fact that I’m so pale here. I’m not a vampire, I promise. Tagged breast cancer, breast exam, cancer patient, chemo, doctor, fighter, health, her2, inspiration, johns hopkins, lean in, life lessons, motivation, pink ribbon, positivity, surgery, survivor, table, warrior, yayoi kusamaBookmark the permalink.